For detailled feature descriptions have a look into the OpenScape Busisness Datasheet which is availabe within the Documentation Section of this wiki site. 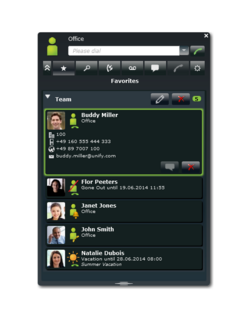 Several HW platforms are available within the OpenScape Office product family. All-In-One UC Appliance mit Unterstützung für bis zu 500 Teilnehmer für IP, Digital (UP0E), ISDN (BRI), Analog (a/b) und Cordless (DECT). Anbindung ans öffentliche Netz über ITSP (SIP), ISDN (BRI und PRI), Analog, Onboard-IP und CAS (in ausgewählten Ländern).